The only place you used to see arbors and pergolas were in the parks and trellises were used by old ladies growing roses or in the movies to give the guy a way to climb up to the girl’s room only to fall off on the way down. Then about 5 years ago people stared to realize that these outdoor structures had an innate natural beauty, that when added to their yards, brought serenity and peace. Though you can get these garden features in many sizes and materials, it’s the natural wood structures that stand out as the most magnificent. Arbors and pergolas are similar in that both are stand alone pieces where vines and flowers can weave their way throughout the canopy and both are known to be used at parties, weddings and other celebrations that have need for elaborate walkways or archways. The difference is the type of canopy and this is where the trellis becomes a fascinating addition to the mix. Though arbors have archway tops and, for the most part, pergolas have square or rectangle tops, both can and do utilize the trellis on the canopy to give the vines something extra to cling to. Many arbors also use the trellis as a side piece for the same reason. Pergolas can also be attached from the side to create a cover for a porch or patio as well as a stand alone garden structure for a special place on a lawn or to create a sitting area away from your home. 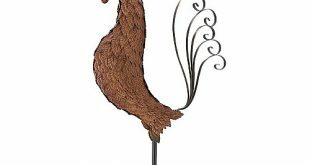 They are both versatile and beautiful and make great additions to any yard or garden. 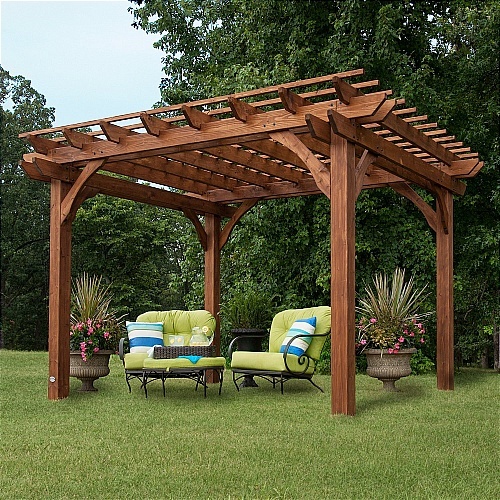 The best word to describe a garden pergola is regal. Outdoor pergolas make strong statements of tradition, beauty, peace, tranquility and rest. You can start and end your day enjoying this wonderful structure that originated in Egypt and was very popular during the Resonance and with Italian gardeners. Pergolas are meant to be places of rest and shade. Traditionally, garden pergolas have vines that grow up the posts and intertwine the trellis tops to provide respite from the sun on the hottest of days and relaxing place to enjoy watching the sun come up in the morning and the sunsets at dusk. Pergolas add so much to weddings, anniversaries and other distinctive gatherings and can be lit up at night to bring out the perfect romantic touch to the evening. There is nothing more lovely than the decor of a natural wood pergola against a moonlit night…. 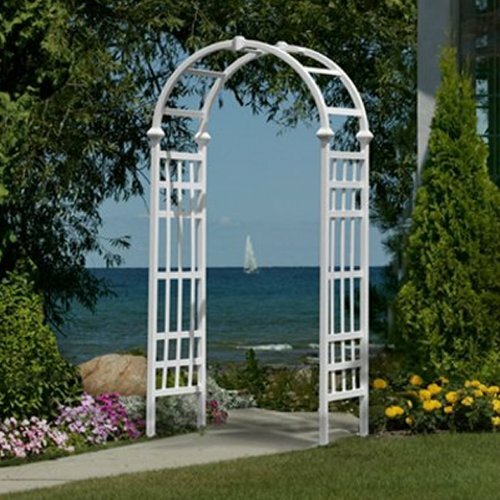 One of the greatest ways to welcome your friends and family to your yard is with a beautiful decorative garden arbor. Whether you want to give your yard a distinctive edge for a gathering or party or just enjoy a new and unusual entrance to your garden, it can be done with stunning, hand-made, all natural cedar arbors or with simple metal and vinyl arbors. The arches make wonderful additions to outdoor weddings, graduations and anniversary parties as well as fantastic focal points of entrances between yards, into garden or swimming pool areas. Garden arbors can be fitted with beautiful gates and attached to fencing to create a magnificent boundary for your yard. As one of the more versatile garden structures, cedar arbors come well sanded so you can paint, stain or let age naturally. 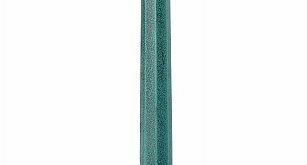 Also available are vinyl and metal arbors that weather very well and will last for many years to come. Arbors can be moved around rather easily and assembled quickly so you can be experiencing your new look as quickly as possible. Arbors are traditionally smaller than pergolas and are fantastic as entrance areas into your garden or yard. You can also attach a gate inside an arbor as well as fencing on the outside creating a wonderful covered entrance into your fenced yard. Many people love to be married under arbors in parks and backyards thus making wedding arbors very popular. 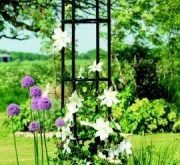 Trellises seem to be the forgotten garden feature that most avid gardeners could not do without. The misunderstood trellis is what makes those succulent, fragrant flowers that climb up walls and wind themselves around arbors and over pergolas behave in an orderly fashion. They also come in many different sizes and shapes from types of plastic to natural cedar trellises. If you have climbing vines then you have to have a great garden trellis. 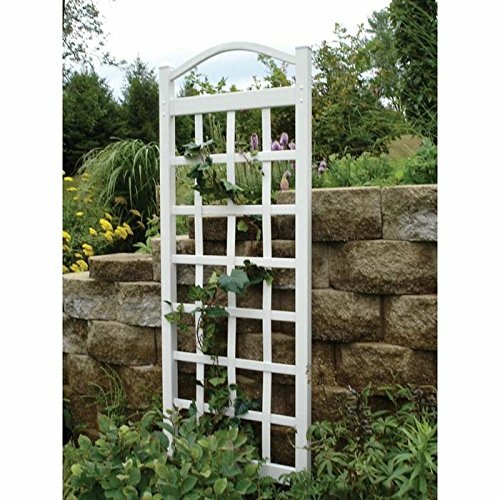 There is nothing better than experiencing the beauty of a trellis whether it be attached to a wall, within a fence or in your yard or garden. Trellises are the perfect solution for tomato plants, cucumbers and other climbing vegetables as well as roses and the many varieties of climbing vines. 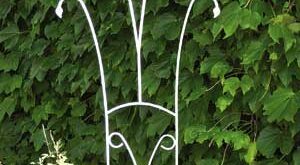 Incorporating a trellis into a fencing structure and letting the vines create a natural barrier is a great and inexpensive way to put up a boundary around a yard or garden. No matter how you want to spruce up your yard; bringing in an arbor, a garden pergola or adding a trellis feature are all great options. The biggest decision you will most likely make will be man-made materials or hand-crafted natural wood. After that is made, it won’t be long until you are enjoying the shade of your beautiful outdoor structure.